At Hand Brew Co we produce a mix of modern and classic beer styles in both keg and cask, from heavily dry hopped Pale Ales to Bitters, Old Ales and Stouts. Our brewery is based in the iconic Hand in Hand Brewpub in Kemptown, Brighton and operates as a towery brewery spanning 4 floors of the pub. The brewery was installed in 1989 by legendary landlord Bev Robbins and ran as the Kemptown Brewery until the mid 2000s when he sadly passed away after battle with cancer. An award is still given away at the annual local CAMRA beer festival in his honour. After then it was the residence of Brighton Bier for a number of years before they expanded and we took over. We started brewing in August 2016 producing cask ales from the brewery’s two open square fermenters and a year later started producing keg with the addition of two converted 800 litre cellar tanks. Over the late part of 2017 and early 2018 we struggled to keep up with demand for our beers and maintain the quality in fermentation we desired (the square fermenters were not temperature controlled or insulated) so we decided an upgrade/expansion was needed. This led us to order three brand new, custom designed, dual purpose vessels in June 2018 for fermenting and conditioning to produce keg and cask. We then went about changing the layout of the cellar to accommodate these by knocking down two walls, erecting a new one, lowering the floor 4 inches and scrapping the two old square fermenters. The new tanks were then lowered through a hole we had to cut in the pub floor and hooked up to a brand new chilling system to control the temperature in them and the two existing cellar tanks. Everything was finally commissioned in early Jan 2019 giving us nearly double the capacity we had before and precise control over fermentation temperatures allowing us to produce lagers as well as ales in keg and cask. We like to brew highly drinkable and approachable beers while still introducing people to modern styles and promote drinking in, and supporting independent venues. We’re big lovers of cask ale and will always produce most styles for this format, as sometimes you just can’t beat a proper pint of cask beer. You can find our beers on tap permanently at the Hand in Hand and in independent pubs, bars and venues across Sussex. 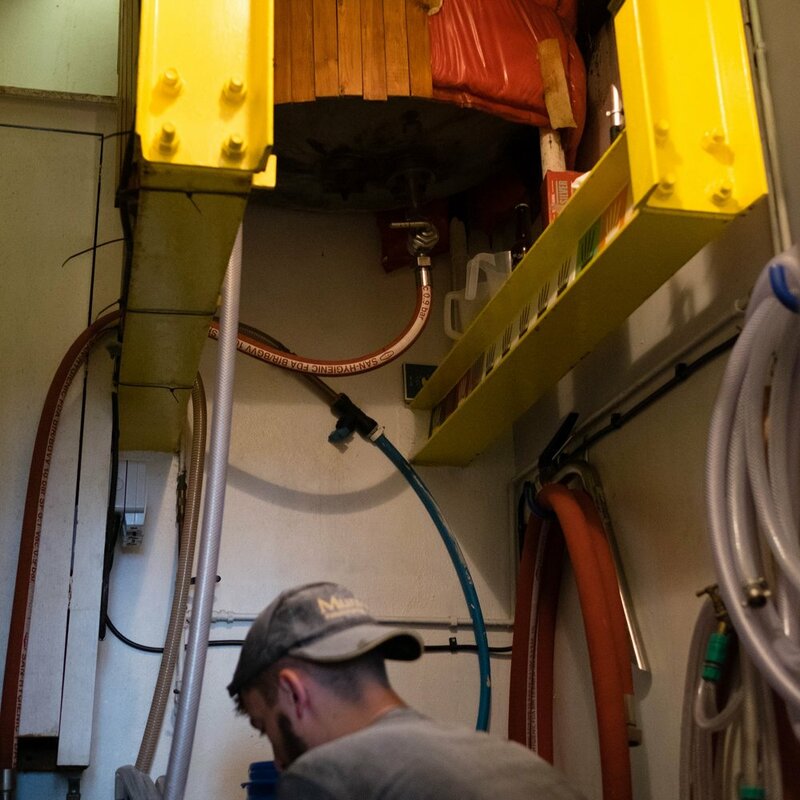 The day to day running of the brewery is done by Jack who, having studied for a Diploma in British Brewing, takes care of everything beer from cleaning tanks to cleaning floors to cleaning casks. When not cleaning, he spends his time working through the biscuit selection from the newsagents next door. As well as running the pub full time Jen also handles sales for the brewery and is probably the friendliest person you'll ever meet. Hailing from Newcastle, she's a tea loving Geordie lass who's the life and soul of the pub and brewery. Clark is everything design to do with the brewery having years of experience in the industry. He does everything from our pump clips to website design and deals with last minute artwork requests like a boss.